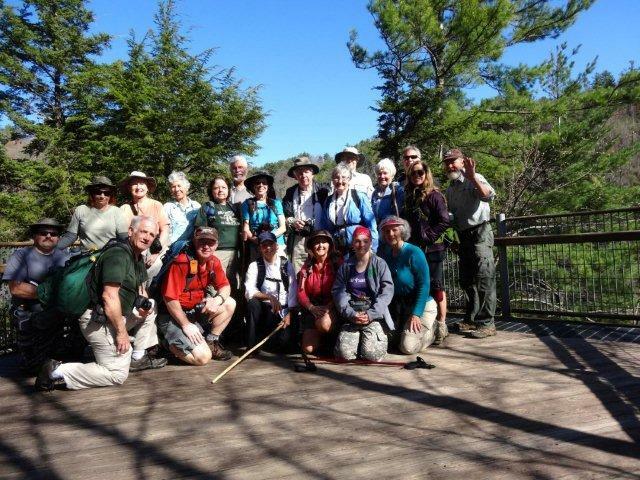 We began and finished the 4 mile hike with 20 happy hikers. I wasn’t sure what kind of show that the wildflowers would put on because of never having hiked this trail in April before. But before we got out of the parking lot, there were delightful wildflowers like Fothergilla and Kidney-leaf Buttercup. The Spring warblers were keeping the ears delighted as well with Black-throated Green Warbler and Black and White Warbler and more. The waterfalls, Upper Whitewater and Corbin Creek Falls were flush with water and fury of sound as we passed by. The slow mosey down the hill was due to the many areas of abundant spring ephemerals to notice, photograph and share with others. One new section of steps was well appreciated by the group, some of which had volunteered to do the arduous work of installation in the remote section of trail. The day could not have been any better weather wise or flower wise. I think we all learned something new in our walk with Spring on the Foothills Trail.